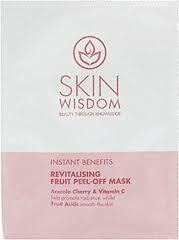 I love any kind of peel off masks, I love sticking one on and then spending ages picking it off(lol)...sad I know!! I spend ages trying to get as much off in one go...much to my poor child's dismay..screaming at his momma to stop..he thought my face was falling off...!! This mask is available at Tesco for just 1.49euro. Now Tesco is not exactly renowned for its skincare, but it should be -- especially its Barbara Daly and Skin Wisdom ranges, which are both high on quality and low on price. The main reason for this is the woman behind it, Bharti Vyas, who is a famous holistic beauty therapist who developed the range.